Smith Marketing Services is proud to have played a big role in the marketing and buzz-building of Railway Interchange 2017. 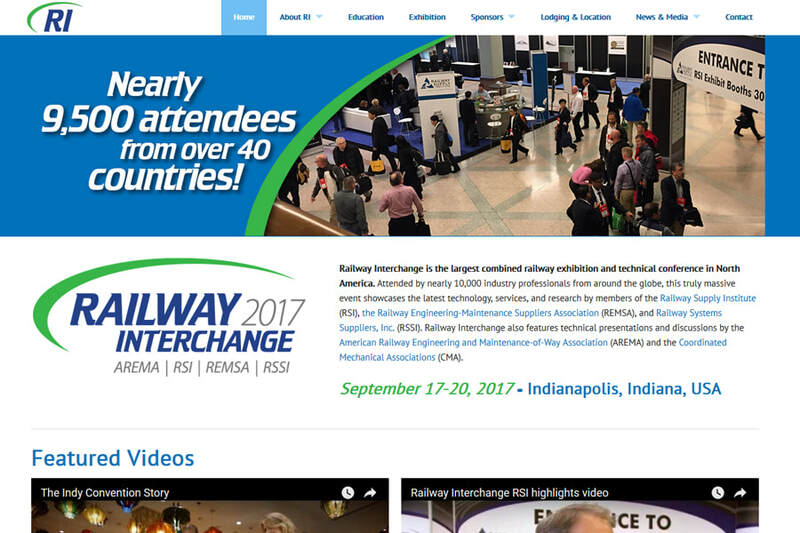 Not only did we re-brand this show -- which is held every two years, is North America's largest rail supplier show, and is the joint undertaking of all four leading rail-supply associations (RSI, RSSI, REMSA, and AREMA) -- we developed and maintained the show website, produced the official show highlights video, produced several promotional "Booth Blast" videos for exhibitors, and designed/managed client booths at the event. Whether you're a member of the rail sector -- or looking to apply the same excitement, firepower, and professionalism to your own industry -- take a look and give us call to put us to work on YOUR next project! A new RI brand-mark from SMS updated the show's previous look, while achieving a balance with the important brand names of the show's association sponsors. SMS also produced responsive logos and a brand-ID kit/set of graphic guidelines that ensured materials provided by other show vendors (e.g. : promotional premiums, way-finding signage, show guide, etc.) had a unified look. One in a series of print ads SMS produced for the show, each of which ran in key RR industry trade pubs in months leading up to the event. SMS's responsive website for the RI show featured the new RI brand ID; a dynamic homepage (including videos, Twitter feed, and show news); flexible and easy-to-update banners and sliders; and easy access to the show's mobile app, real-time floor plan, and event schedule. Click here or above to see the website up close! Here is the top-level RI 2017 "highlights video" we produced -- featuring show stats, exhibitor interviews, and some attendee perspectives right from the floor. SMS was honored to be the show's approved video vendor -- via our proprietary, promotional "Booth Blast" video package -- which shined a spotlight on some of the event's exhibitors. The package also included pre- and post-show email blasts to all registered attendees, creating additional value and booth traffic for these same exhibitors. Shown here, from left to right, are Pettibone, Plasser American, and Stanley Infrastructure -- all of them REMSA exhibitors and leaders in the Maintenance of Way segment of the RR industry. Once again, SMS lead the booth design and implementation process for our valued client, New York Air Brake. 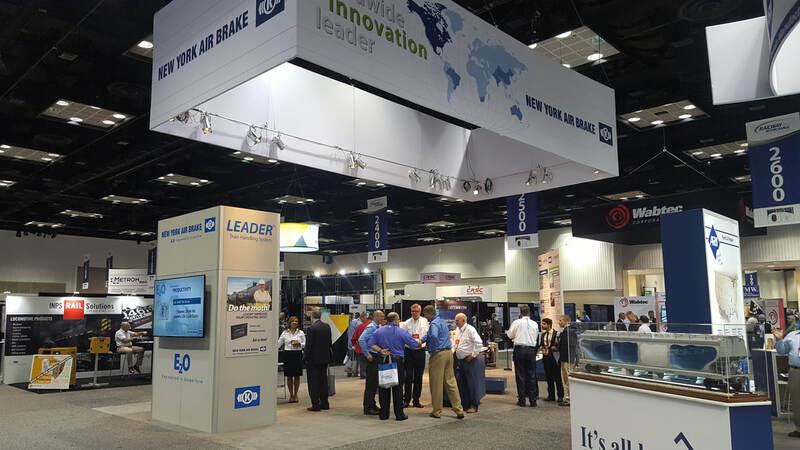 The booth showcased NYAB's wide and well-known array of heavy haul braking and train control technologies... Some of them displayed physically on the floor, while others were spotlighted via A/V presentations and interactive/touchscreens displays. 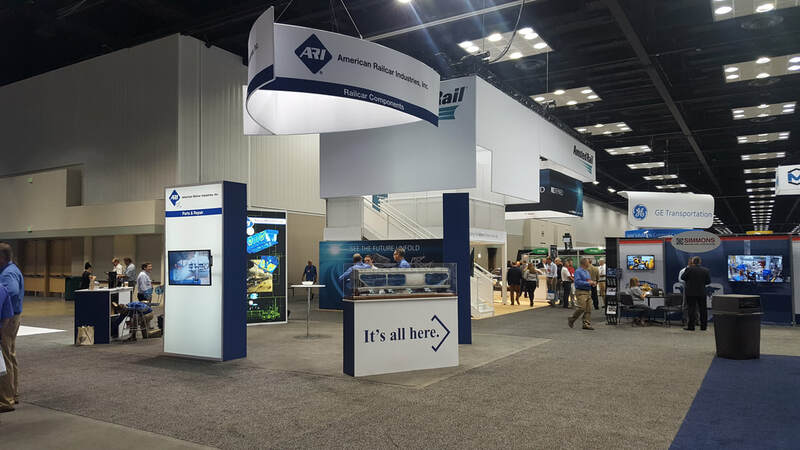 We were also excited to have played a role in the conceptual stages leading to the development of the RI2017 booth for American Railcar Industries. Here, our "It's All Here" theme came to life and helped to drive home ARI's single-source advantages to shippers and railroads. And here's Day 2 -- featuring abbreviated exhibitor interviews with leading RR suppliers Pettibone and Stanley Infrastructure. Take a look at SMS's other work for the rail industry -- and other industries, too!